Below is the detailed biography of Ernest Crofts, a British painter in the Victorian Era. His genre has been historical paintings and paintings of historical scenes from and before the Victorian Era. Let’s discuss his life and paintings. Ernest John Crofts was born on the 15th of September, 1847 in Leeds, England. His parents were John Crofts, a Justice of the Peace and also a manufacturer and mother – Ellen Wordsworth was the daughter of an industrialist. She is related to the famous poet – William Wordsworth. He went to the Rugby boarding School in England and during his academics, he showed a flair for art. After his academics, he moved to Berlin to pursue more skills in art and painting specifically. He experienced the Schleswig Holstein War in 1864. He then returned to London and came back to learning his art from AB Clay, a famous painter. He went to Germany again in a few months time and studied at the Dusseldorf School of painting. He painted all across Europe and learned different styles until he apprenticed under the German military painter – Emil Hunten. He exhibited his very first painting the ‘Retreat’ in 1874 which was a scene from the Franco – Prussian War. He also exhibited another painting from the same war ‘One touch of nature makes the whole world kin’ that won him a medal at the Crystal Palace. He regularly exhibited at the Royal Academy on an annual basis. 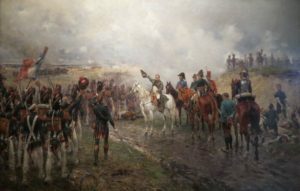 In 1875, he exhibited a painting at the Royal Academy that was called ‘Ligny’ and was a scene from the Battle of Ligny. This painting was also exhibited at the International Exhibition in Philadelphia. Another interesting painting exhibited by him was at the Royal Academy in the same year. The painting displays the morning scene of a war showing tired military men. 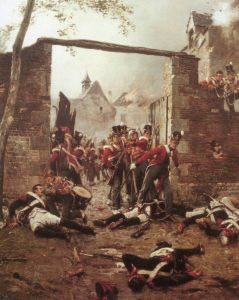 The painting is called the ‘Battle of Waterloo’. 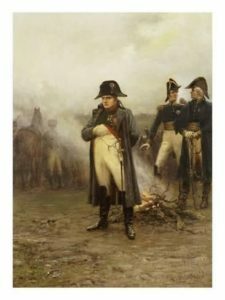 His paintings of Napolean Bonaparte are appreciated throughout the world. These are unique paintings of Bonaparte in action during the war. Such paintings of him came only after Ernest began to paint them. Until then, there were portraits that were charismatic and attractive but Ernest’s paintings were genuine and expressed Bonaparte’s stress and bravery during times of war. He received many contracts from different emperors for him to have painted their war scenes. Some of them he would not accept. He was a fully elected Academician in the Royal Academy in the year 1896. He was also a keeper and a trustee at the Royal Academy due to his works and mainly due to his tough charisma and personality. He was also a chief director of the academy art schools and a chief custodian. He also painted the occasion of the distribution of medals of the Boer War. This was commissioned to him by the king. His absolutely appreciable painting was the large scene of the funeral of Queen Victoria. He is also known for his painting of the death and burial of King Charles I. He painted this in a trilogy and the painting was heavily criticized with regards to historical details and more. 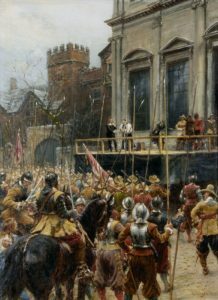 However, the paintings had mixed reviews, some criticized the detailing of historical events and some appreciating the concept and the idea behind the painting. Ernest married Elizabeth Wüsthofen of Düsseldorf, a German woman who he met on his first visit to Germany and his apprenticeship. They married in the year 1872. They had a daughter together. They lived in a house called ‘The Green’ in Suffolk. Ernest died on the 19th of March in the year 1911 out of pneumonia. He died at his Burlington House and is buried at the Kensal Green Cemetery. He is remembered for his excellent work in capturing not only the plain scenes but also the emotions, wit, and courage of the soldiers in the various military wars.